After Kylie gave birth, so many things happened that I didn’t write about because I didn’t feel like it, and now it’s been more or less a month, I’d want to read about this experience some time in the future. 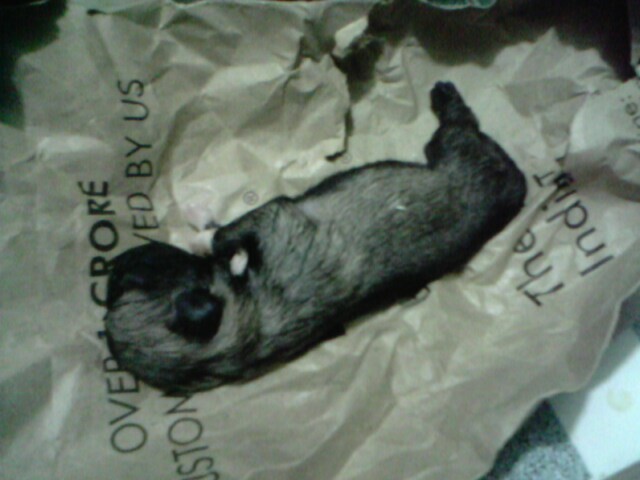 This is the poor male puppy that died. Mom didn’t want to just throw it in the garbage so she kept it in the fridge while we thought of where and how to dispose of it. Long story short, it is now resting in the garden outside the gate of Mia‘s house. It’s safe there because we know where it is and we can visit its grave any time (weird, i know, but we love our dogs that much even if they didn’t last that long with us). The next puppy that came out was a surprise because it has a white coat with brown spots. The shih-tzu blood is showing. After that is a female pup with white coat and black spots. She looks more like a shih-tzu because her coat was similar to that breed. It was smooth and long. The last pup that came out was also male, the coat is a lighter shade of fawn and has no black mask that is typical in pugs. Cyndi’s pups have beautiful faces and mom wants to keep them because they have unusual coloring. Two days after, i noticed the black and white pup was small and skinny while its siblings were getting bigger. I realized the pup has had a hard time feeding from the mom. At one point her umbilical cord was bleeding, the stem was falling off when it wasn’t ready yet, it hasn’t clogged up. I was scared and I was worried that it will die right then and there from blood loss. Mom told me to be strong and to think positive, but i was scared coz I’ve read articles online and the puppy was getting colder, we had to incubate her separately from her siblings. When i woke up the next day, she was still alive and kicking. We were so happy because her will to survive was strong. On the 6th day, i noticed her right eye was swollen so i took her to the vet. The vet felt the swollen eye and pinched it, pus came out and she said that the eye was infected and it would not develop, the pup would end up blind. I said i didn’t care as long as she survives. When i got home i realized it was okay for her to die so she wouldn’t have to suffer. That whole day she kept crying and crying, but she still fed when i hand feed her milk. I thought she was bloated so i tried making her burp. She would cry non-stop and i would constantly massage her tummy and she would make a sound that seems like relief. When she gets cold I put her back in the incubator, after a while she’ll cry again and I’d pick her up. When we were about to sleep, she was sleeping, making small noises, not really crying. When we woke up the next day, she was already dead. She wasn’t moving, i carried her and stroked her soft, smooth fur. I hugged and kissed her. I just wanted to hold her like that, I was sad but happy at the same time because she didn’t have to suffer anymore. I had her buried beside her brother over at the garden in Mia’s house. Last picture of Cyndi with all 3 puppies. When i got home it was like she could tell one of her pups were missing. You can see it in her eyes and sometimes she goes over at Kylie’s bed to check if her missing puppy was there. It was different with her first born because she took care of the black and white puppy for a week. What we did what smuggle a puppy of Kylie’s when she’s not looking and put it in Cyndi’s bed so she can breast feed them. She has more milk than Kylie and it did her good. After a few days, it was like Kylie understood why we were doing that. Her puppies were getting bigger and she’s having a hard time producing milk even with milk enhancers. Her 4th puppy was the smallest, we put her in Cyndi’s bed to she can drink more milk. Both Kylie and Cyndi don’t mind and it seemed they really understood what was going on. Cyndi didn’t groom the foster pup at first and Kylie would check her from time to time and groom it herself. The puppies are big now, they started walking a couple of days ago except for Cyndi’s puppies who are only starting to learn how to walk now. They often share a bed inside the playpen and would sometimes get off it when they’re feeling hot or when they have to poo or pee. It’s so amazing that they do that, at a very young age they know better than to mess up their bed. I think it’s because when Kylie stayed with them, every time she needs to poo or pee, she goes out of her cage and looks for a place to do her business. I don’t know how to explain it, coz when they were puppies we cleaned up after them coz Hearty rarely does. How sweet! Newborns are a lot of work but so worth it!